The course covers a variety of different subjects including: how the industry works, the principles of electricity, how to classify appliances, avoiding dangers in the workplace, legal requirements, recording results and the correct use of a PAT tester. The course is a one-day event and takes approximately seven hours to complete. Included in the course are study materials such as the Handbook of Portable Appliance Testing and a PAT reference card. Upon successful completion of the course the trainee will be awarded a Certificate of Competence. This is a qualification that allows the individual to legally practise the trade. To complete the training the participant must complete a 20-question exam. This test is designed to cover the theoretical aspects of the course and to show understanding of how the PAT testing process works. Candidates on the course will be monitored throughout the examination and will also have to demonstrate their practical skills in order to show that they are competent. The Northampton PAT training course ensures that all of the participants are taught the skills they will require in order to work in the industry. The training course is a combination of theory and practical exercises that fully set up the individual for work. After completing each one of the course’s theory modules learners have the opportunity to test their knowledge practically under the supervision of an industry professional. This is a one day course starting at 9am and finishing at 4pm. There will be a lunch break, food is provided for no extra charge. The course is open to everyone, no previous electrical background is required although it would be advantageous. There are no formal pre-requisites for this course, but any previous experience with electrical systems would be useful. We suggest that you read and bring along a copy of the IEE Code of Practice. Although this is not essential for this course, candidates will find it useful in their electrical testing careers. 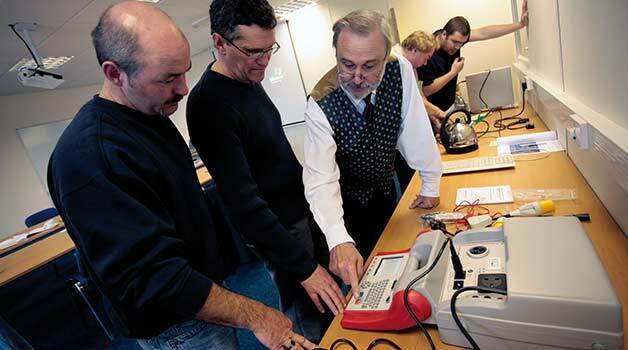 The Northampton PAT training course provides a great starting point for people who are interested in working as a professional PAT technician. This type of training allows participants to gain a certified qualification that will allow them to legally operate a business within the industry.